- International: $100 - $250 or use your own shipping account. 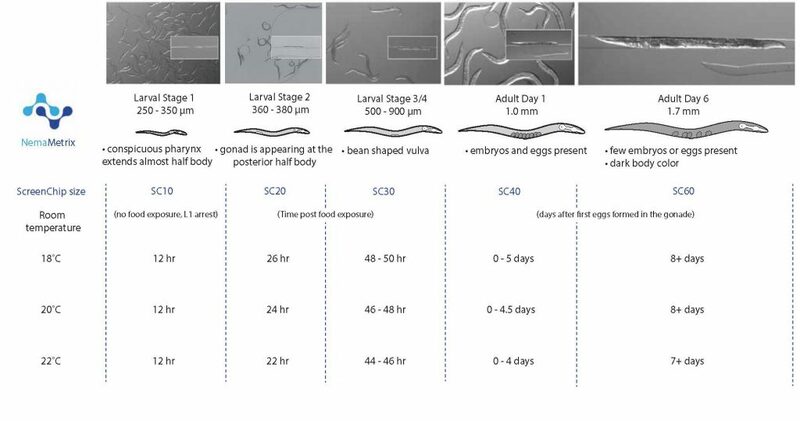 The ScreenChip Cartridge, used with the ScreenChip System is a microfluidic device designed for rapid, accurate data collection from C. elegans and related nematodes. Real-time data is recorded using a pocket-sized amplifier and streamed to a PC or Mac via Bluetooth. Just by sliding it into place, each disposable cartridge effortlessly makes a robust connection to the ScreenChip Dock. The ScreenChip moves worms one by one from an Eppendorf tube and into a recording chamber which detects electrical signals from the pharyngeal pumping of the worm. Each cartridge is capable of recording up to 50 worms per chip, or one to two days of use. Available in packages of 10. The variety pack includes 2 x SC10, 2 x SC20, 2 x SC30, 2 x SC40, and 2 x SC 60.